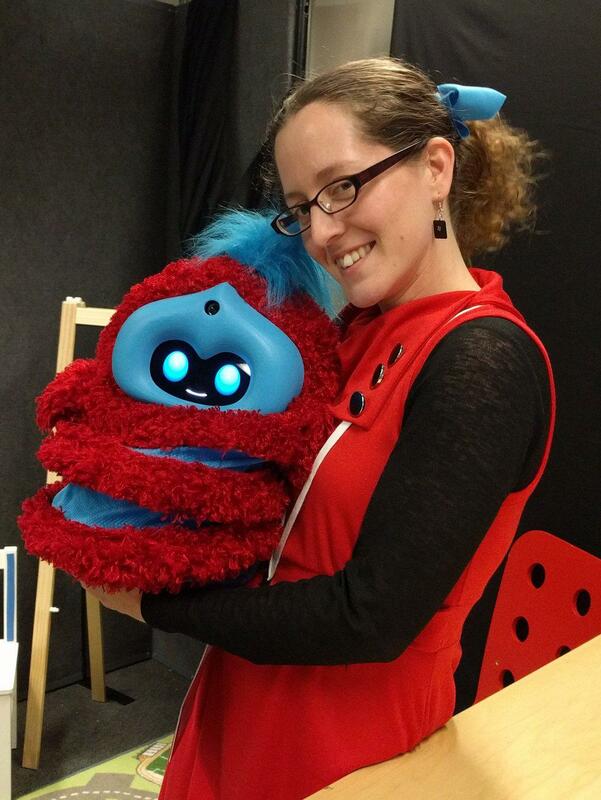 Jacqueline Kory Westlund is a Ph.D student in Dr. Cynthia Breazeal's Personal Robots Group (PRG) at the MIT Media Lab. Her research focuses on developing and evaluating social robotic learning companions to support young children's language learning and social and emotional development. She asks questions about how to create more effective robotic learning companions, how children understand social robots, how context and framing affect child-robot interactions, and the ethics of using robots in children's lives. 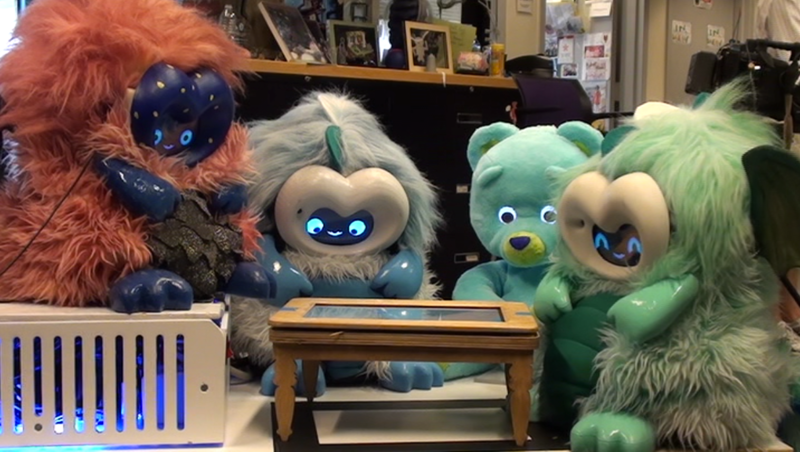 Three DragonBots and Huggable play a story game together! Jacqueline was awarded an NSF Graduate Research Fellowship in 2012-2015 and a Media Lab Learning Innovation Fellowship in 2016-2018 to support her research at MIT. Prior to coming to the Media Lab, Jacqueline spent a year researching human emotion and learning with Dr. Sidney D’Mello at the University of Notre Dame, and worked at NASA for two summers developing autonomous vehicles and laser space robots. She holds a BA in cognitive science from Vassar College. Jacqueline with Tega during the Spring 2016 member event! For current news, recent publications, and latest projects, see https://www.jakory.com/ and http://robotic.media.mit.edu/news/! Gordon, G., Spaulding, S., Kory Westlund, J., Lee, J., Plummer, L., Martinez, M., Das, M., & Breazeal, C. (2016). Affective Personalization of a Social Robot Tutor for Children's Second Language Skills. Proceedings of the 30th AAAI Conference on Artificial Intelligence (Palo Alto, CA). Kory Westlund, J. *, Gordon, G.*, Spaulding, S., Lee, J., Plummer, L., Martinez, M., Das, M., & Breazeal, C. (2015). Learning a Second Language with a Socially Assistive Robot. In Proceedings of New Friends: The 1st International Conference on Social Robots in Therapy and Education. Kory Westlund, J. M., Gordon, G., Spaulding, S., Lee, J., Plummer, L., Martinez, M., Das, M., & Breazeal, C. (2016). Lessons From Teachers on Performing HRI Studies with Young Children in Schools. In S. Sabanovic, A. Paiva, Y. Nagai, & C. Bartneck. Proceedings of the 11th ACM/IEEE International Conference on Human-Robot Interaction (Christchurch, New Zealand). Kory Westlund, J., & Breazeal, C. (2015). The Interplay of Robot Language Level with Children's Language Learning during Storytelling. In J. A. Adams, W. Smart, B. Mutlu, & L. Takayama (Eds. ), Proceedings of the Tenth Annual ACM/IEEE International Conference on Human-Robot Interaction: Extended Abstracts (pp. 65-66). Kory, J. & Kleinberger, R. (2014). Social agent or machine? The framing of a robot affects people's interactions and expressivity. 2nd Workshop on Applications for Emotional Robots held in conjunction with the 9th ACM/IEEE International Conference on Human-Robot Interaction. Kory, J. (2014). Storytelling with robots: Effects of robot language level on children's language learning. Master's Thesis, Media Arts and Sciences, Massachusetts Institute of Technology, Cambridge, MA. Kory Westlund, J. M., Martinez, M., Archie, M., Das, M., & Breazeal, C. (2016). A Study to Measure Effects of Framing a Robot as a Social Agent or as a Machine on Children's Social Behavior. In S. Sabanovic, A. Paiva, Y. Nagai, & C. Bartneck, Proceedings of the 11th ACM/IEEE International Conference on Human-Robot Interaction: Late-Breaking Reports (pp. 459-460). Deception, Secrets, Children, and Robots: What’s Acceptable? Kory Westlund, J., & Breazeal, C. (2015). Deception, Secrets, Children, and Robots: What’s Acceptable? Workshop on The Emerging Policy and Ethics of Human-Robot Interaction, held in conjunction with the 10th ACM/IEEE International Conference on Human-Robot Interaction. Kory Westlund, J. M., & Breazeal, C. (2016). Transparency, teleoperation, and children’s understanding of social robots. In S. Sabanovic, A. Paiva, Y. Nagai, & C. Bartneck, Proceedings of the 11th ACM/IEEE International Conference on Human-Robot Interaction: The 11th Annual Human-Robot Interaction Pioneers Workshop, (pp. 625-626). IEEE.